In the run up to World TB Day, tennis star Leander Paes and India's world women's boxing champion Mary Kom lent their support to IDFs awareness raising activities. The two celebrities appeared in multilingual posters which were distributed across India, including at Dominos Pizza outlets. 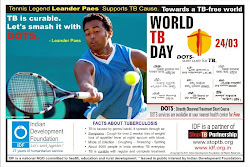 Leander Paes' message said "TB is curable....Let's smash it with DOTS" while Mary Kom's message said: "TB is curable ....Let's knock-out TB." 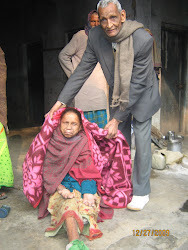 Mary Kom is a boxer from Manipur, India. A mother of two, she has won the World Boxing Championships five times and has been dubbed 'Magnificent Mary'. 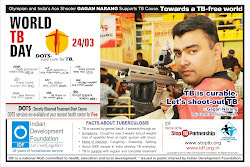 The endorsements were part of IDF's month-long TB awareness programme for World TB Day which started on 24 February. Dr. Vianca E. Laloo, Technical Officer, Secretariat, Partnership for TB Care and Control in India congratulated the work of IDF in tuberculosis control in India. 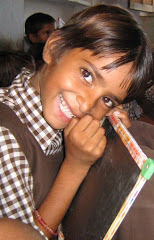 IDF feel proud to be a partner of Partnership for TB Care and Control in India on World Health Day (07-04-2011) and strengthen TB work in the areas of advocacy, communication and social mobilisation across the nation.